ALCOHOL, DRUGS, and Riding Do Not Mix. Alcohol and/or drugs slow down a person's ability to react, making it more difficult to avoid objects, including other riders, on the trail. It affects your judgement and reasoning, and increases one’s likelihood of taking risks. New Hampshire has strict rules and regulations against operating an OHRV or snowmobile while under the influence of alcohol and/or drugs. If you take the chance, you will lose your privileges to operate any type of recreational vehicle or motor vehicle, and will pay substantial fines. The Fish and Game Department promotes zero tolerance while operating an OHRV or snowmobile. "With many states legalizing the recreational use of marijuana, remember riding high is a DWI," said Captain Dave Walsh, coordinator of NH Fish and Game's OHRV Program. Myth-buster: Many people believe in the myth that consuming alcohol can warm up a chilled person. This is not true. Alcohol opens the blood vessels and hides the sensation of being chilled by getting the warm blood close to the skin surface. It does nothing to increase body heat. Instead, alcohol can cool your body down dangerously, increasing the risk of hypothermia. Wear Protective Clothing. The most important piece of protective clothing you can wear is an approved helmet. Make sure the helmet has been approved by either Snell or DOT. State law requires that anyone under the age of 18 who operates or rides in/on an OHRV or snowmobile wear a helmet that meets Federal Motor Vehicle Safety Standards. If you have any questions about the condition of a used helmet, contact a competent dealer and ask their opinion. Know your abilities to ride and do not exceed those levels. Identify the capabilities of the machine you are riding and do not exceed those levels. Always ride at a speed that is reasonable and prudent for the existing conditions. If you cannot control your machine, you are riding too fast, no matter what the posted speed limit is. Know the area you are riding in. Be aware of potential hazards such as washouts and other changing trail characteristics. Get a map of the trails and talk to local riders. Always keep an open mind to learning. You're never too old to learn. Take a class, join a club and ride with a friend. Use common sense when riding. Be prepared; carry a first aid and survival kit. Take along some spare plugs and tools that may not be in the machine’s tool kit. Let someone know where you will be riding and when you plan on returning. If you run into problems, these extra precautions can be time and lifesavers. Many trails are multi-use and are also shared by dog sledders, cyclists, hunters, cross-country skiers, hikers, equestrians, and others. All trail users should be aware of each other. Riders should slow down and share the trail. Be prepared for extreme conditions. Cold temperatures can be dangerous, so wear clothing that is appropriate for your winter activities. Remember, trail conditions are forever changing, so make sure that you operate at a speed that is reasonable for the existing conditions. For example, at night or when operating in other low-visibility conditions, reduce your speed so that you can identify and avoid sudden hazards on the trail or lake. 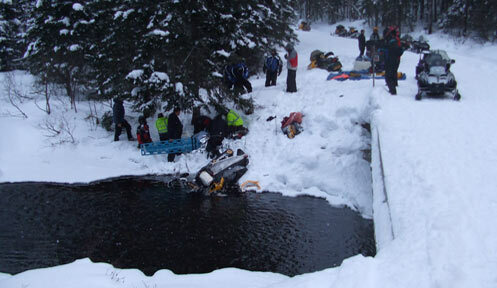 Always be aware of the conditions of the trail or frozen body of water when operating a snowmobile. Always be careful to test the ice before venturing out, even if freezing temperatures have occurred. Many factors affect how ice freezes, so ice thickness will not be same over the surface of a lake. Always check the thickness and condition of the ice before going out and while you are heading to your secret ice-fishing spot. Avoid inlets and outlets and other areas of the lake where there is a current, such as springs or natural formations. The ice in these areas will be thinner and not as strong. Avoid objects embedded in the ice; these warm as they attract sunlight, weakening the ice. Skimming is illegal! The dangerous practice of operating snowmobiles on open water or "skimming" is illegal in New Hampshire. "Operating OHRVs and Snowmobiles safely is all about personal responsibility," said Captain Dave Walsh. "Accidents are usually caused by people driving carelessly, too fast, beyond their skill level, or under the influence of alcohol or drugs. Combine one or more of those factors with other trail users or unpredictable trail conditions, and things will go very wrong, very fast. If you want to enjoy your ride and have an enjoyable adventure, slow down and use common sense."